Eclectic Horseman Sept/Oct 2018. Low down on a down-under clinic and lessons learned. Eclectic Horseman March/April 2017. A professional horseman’s clinic at Joe’s Texas facility. Western Horseman On-Line. Using herd mentality and a bit of reverse psychology on horses to keep their focus and their bodies moving straight ahead. Eclectic Horseman, Jan/Feb 2016. Allowing the horse to search and work at finding a balance. Eclectic Horseman Sept/Oct & Nov/Dec 2014. 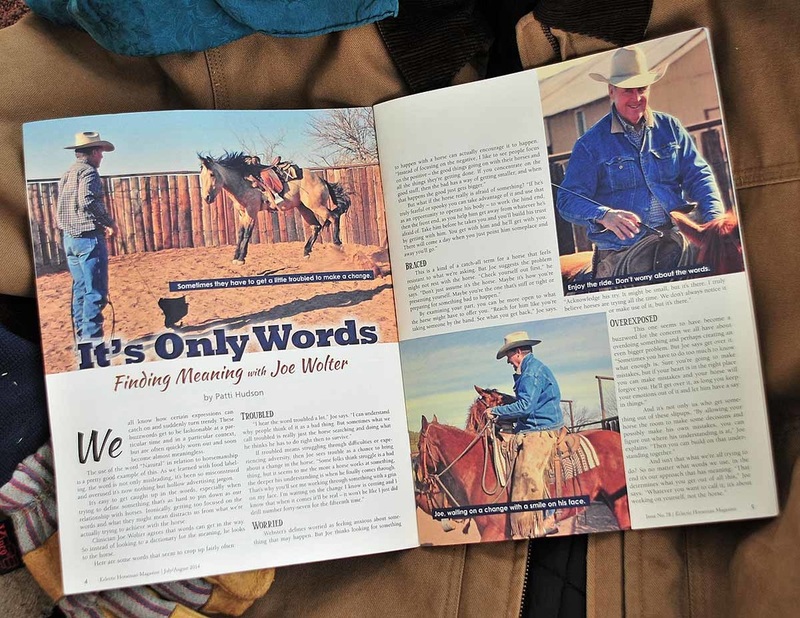 Joe and Jimmie Wolter on buying the right horse. Eclectic Horseman, July/August 2014. Look to horse not the dictionary to find meaning. Eclectic Horseman, March/April 2014. Quiet cattle handling, without turmoil. Eclectic Horseman, July/August 2013. Original, unedited version of article on getting in a learning frame of mind. Eclectic Horseman, May/June 2013. Understanding the role straightness plays in everything you do with horses. America’s Horse, October 2012. Article about how longeing is more than just going in circles. Western Horseman, November 2007. Article by Ross Hecox detailing how Joe Wolter uses the outdoors to develop suppleness, balance, trust and common sense in his horses. Western Horseman March 2007. A personal perspective on Joe Wolter. Quarter House News, February 15, 2007. Riders showcase their versatile ranch horses. Eclectic Horseman, May/June 2006. Cheryl Kimball details her ranch clinic experience at Joe’s Aspermont Texas facility. Western Horseman, December 2005. 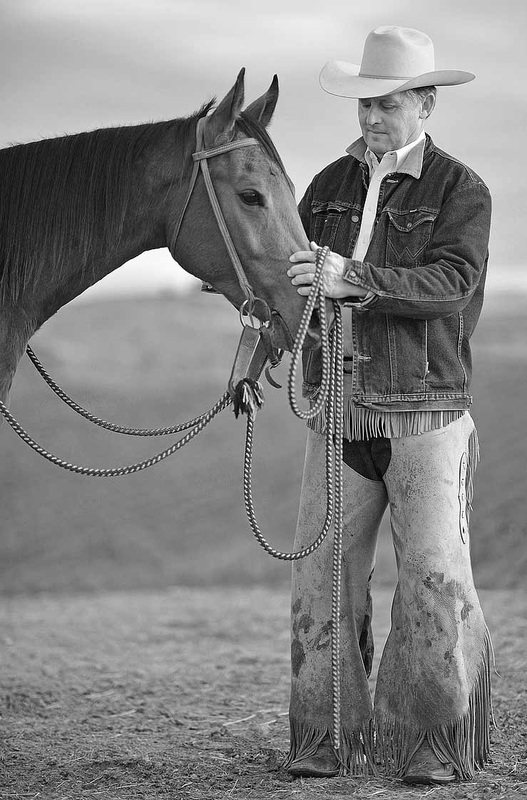 Randy Witte writes about Joe’s ranch work experiences with Ray Hunt and the Dorrance brothers. Eclectic Horseman, March/April 2005. A feature article by Cheryl Kimball reviewing the video “The First Week” with Joe Wolter, Bryan Neubert, and Jim Neubert. Ride, April 2002. Joe Wolter and Little Playgun take the first two events in new AQHA versatility ranch horse competitions. Trails Less Traveled, April 2002.Jennifer Barrort's article about AQHA's new class emphasizes practicality and skill. Trails Less Travel, March 2002. Article by Jennifer Barron about how competing in horse shows helps Joe Wolter start colts. Quarter Horse News March 2002. Joe Wolter wins second Ranch Horse Versatility competition. Ag Journal, Jan. 25, 2002. Newspaper piece on Joe Wolter’s Versatility Ranch Horse inaugural win. First Impressions - Let the horse tell you what his understanding is. Are You WIth Me? - Learning to recognize when the horse is truly with you. Continuing Education - How to keep the learning process going. Cut Your Horse Some Slack - lf the horse thinks he can move, he won’t have to test it. Doing Less Is Progress - The importance of keeping an open mind. Going It Alone - Riding your horse away from his buddies. Looking for Straightness - It’s a great feeling. Minor Adjustments - Make saddling comfortable for your horse. Ranch Roping - The importance of being smooth. Remember Recess - Taking a break can speed up the training process. Send Him In - Trailer loading tips. Starting Colts I - Follows a year of training for one young filly. ﻿Starting Colts II﻿ - Part 2 about training the filly. Starting Your Colt - Taking the first ride carries responsibility. Surprise Endings - lf your horse gets scared, just relax. Turn Signals - Feel how your horse turns naturally. Unfit To Be Tied - Pulling back in is a sign of deeper problems. Yielding To Pressure - It’s the basis of nearly everything we do with horses.